Bassboy wrote: great discussion going on here, my real goal is to use an expression pedal and then control the sound on my amp, or a few external pre like an avalon u5 that way the bass speaks on its own, thats the theory anyway, as simple as possible i reckon, but thanks for all the great ideas. David, I've seen your work and am embarrassed at my poor choice of words - I take them all back! Koa and Mahogany .... excellent combination. Looks great together. 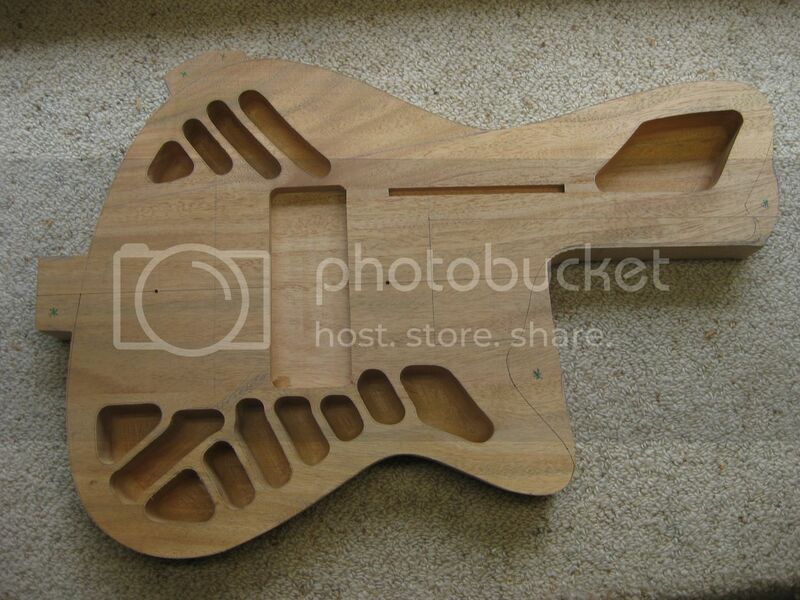 Check out this beautiful fretboard! It's SO PURPLE/RED! 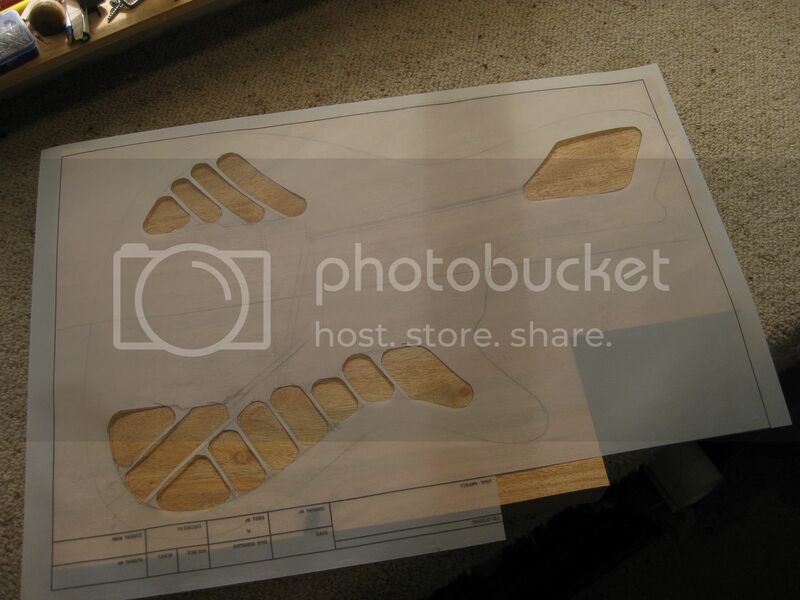 And some shots of the prep and production of the routing template for the chambering of the body. I usually use double sided tape to secure the routing templates but because this body will have an outer 'skin' of Koa, I can secure the template with screws. The remaining holes will be hidden later on. 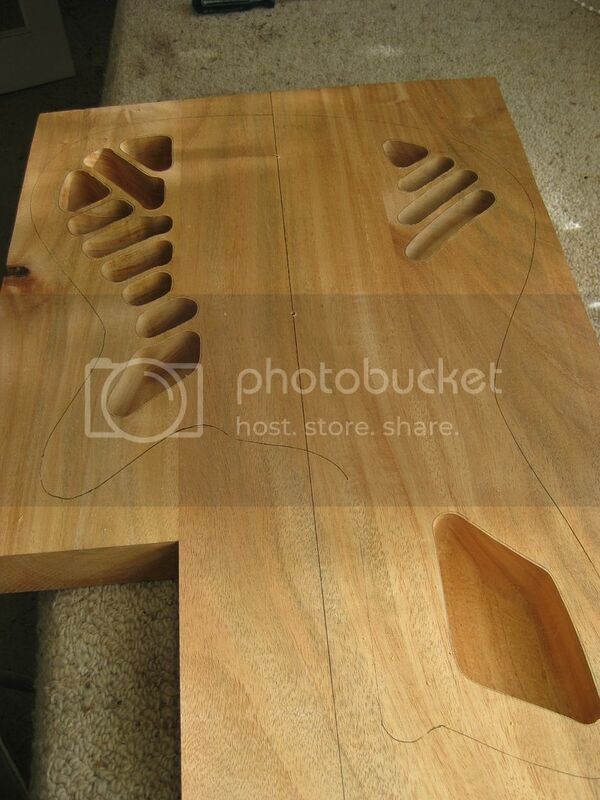 This set of routes is an interesting design feature as it chambers the body which greatly reduces weight BUT instead of just taking out huge areas, I need to support the Koa top with the internal 'ribs' This will stop the 3.5mm top from dipping across the routed sections when I use the vacuum press to laminate the top material to the mahogany body. Some shots of the routed areas. And some shots of the routes. These routes are 38mm deep leaving me with a 6mm depth of material on the back of the bass. I've also used a rounded 16mm bit to route out the chambers leaving a curved bottom to the routes. 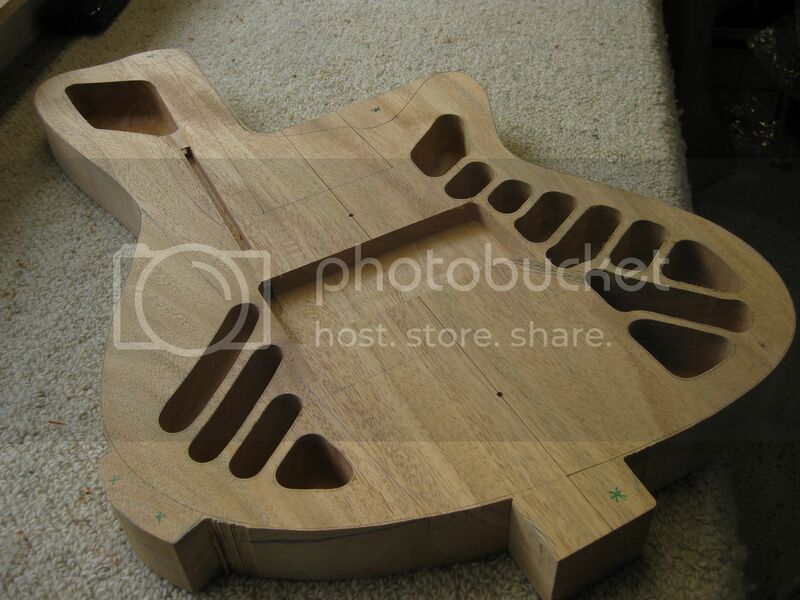 Some update shots of David Galea's bass build. 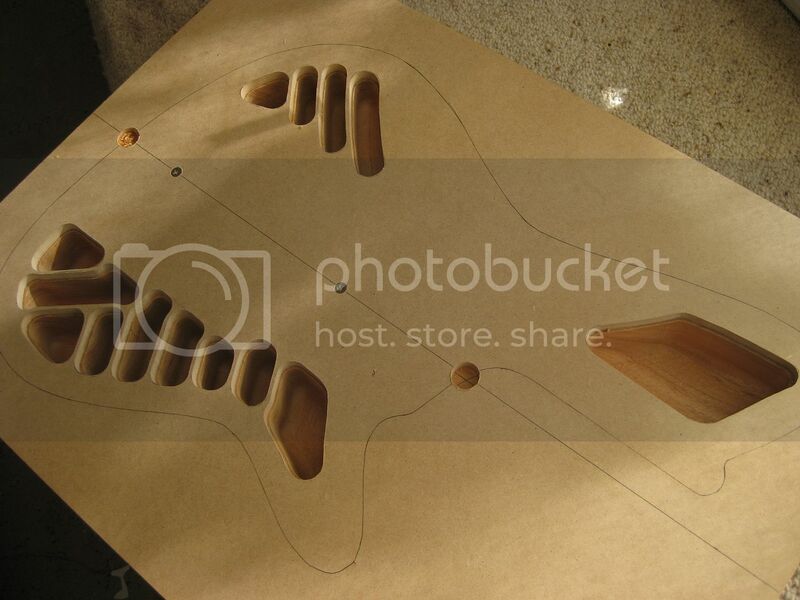 In these shots you can see some more routing for the electronics as well as a cavity route in the area that the pickup will go. 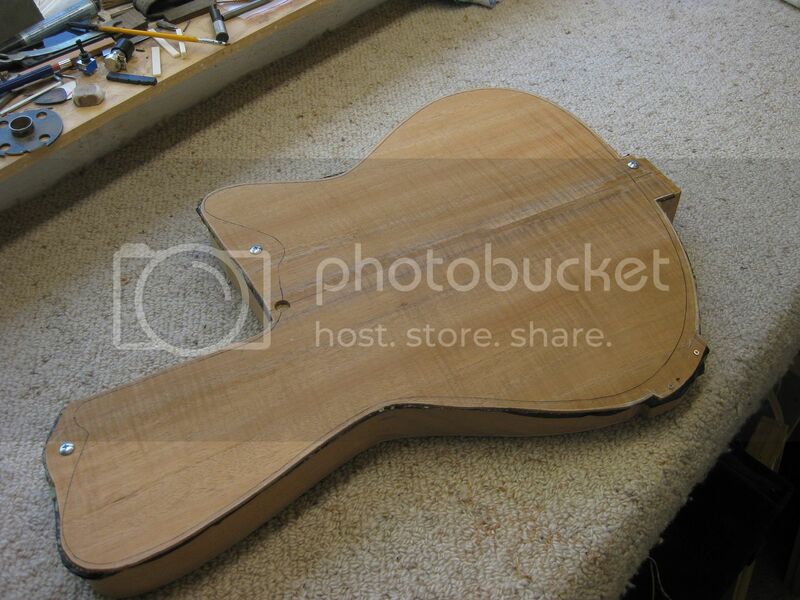 The future route for the pickup won't be as big as this (when the Koa top is installed) but will give me room around the pickup cover (hidden under the top) to run wiring. There's also a small route running from the top bout (where the controls are to be housed) back to the central pickup cavity. These shots don't show it, but the body also now has its forearm cut into the top. 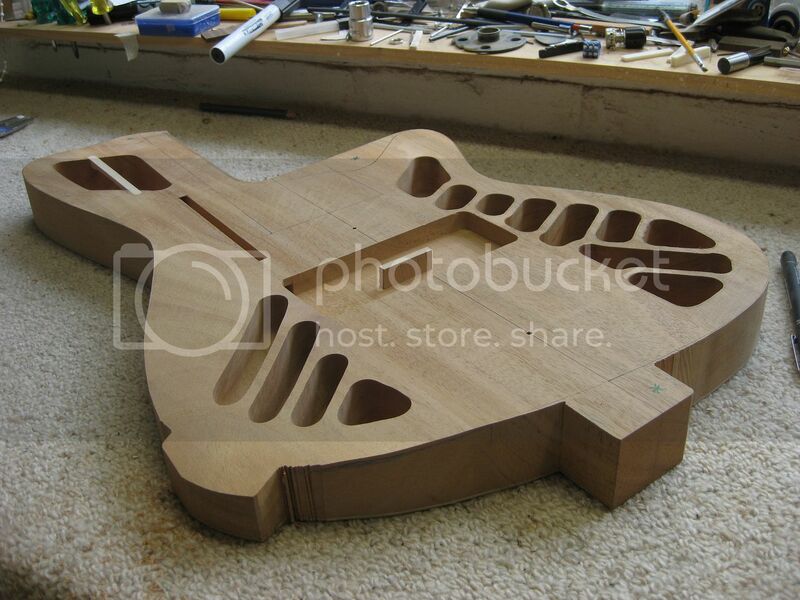 So this week I should have the top with its sub layer of black veneer glued down onto the body! 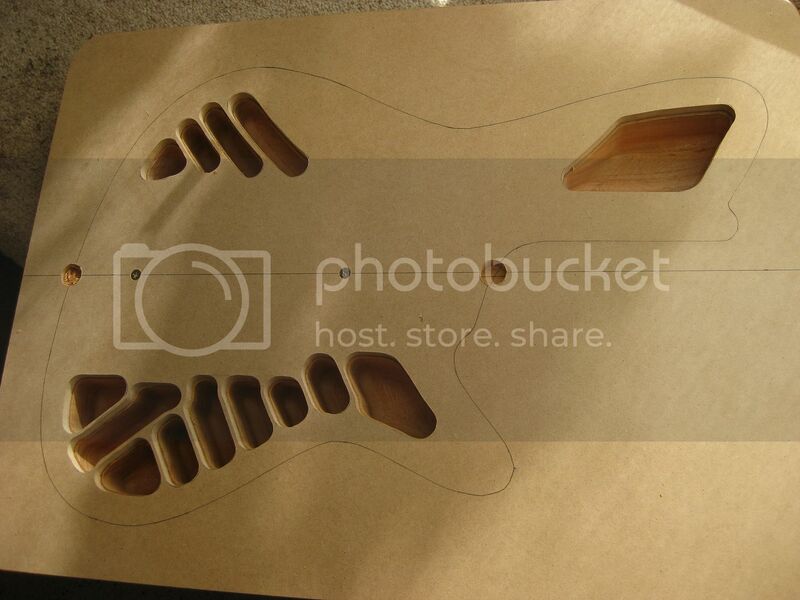 Some more work on David's bass build today. 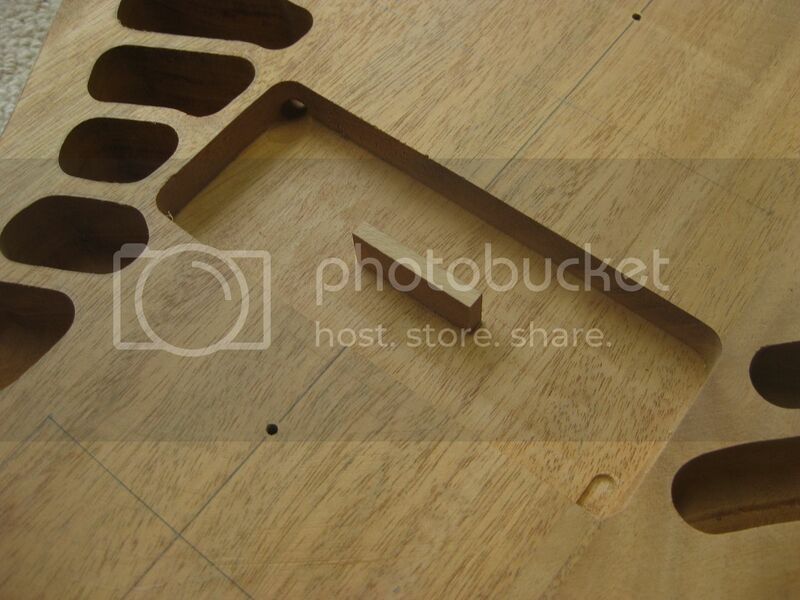 These shots show the forearm curve and some detail shots of the upper bout with its supporting bridging strut and the central pickup cutout with its small supporting piece. 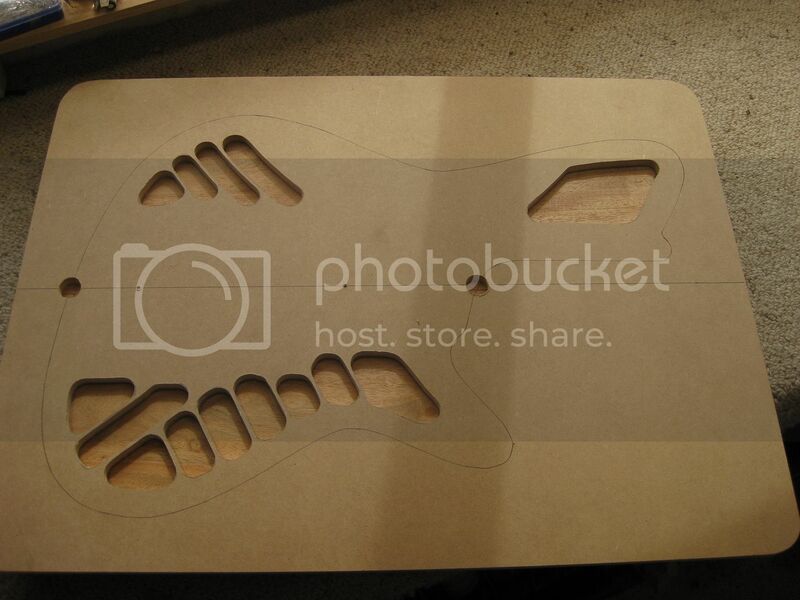 The idea behind these small details is to support the top plate of koa (3mm + 1.2mm of black veneer) over their respective openings, so that when I'm gluing the top material down using my vacuum bag, I don't end up with dipped or dished areas that would be really obvious when the body is painted. 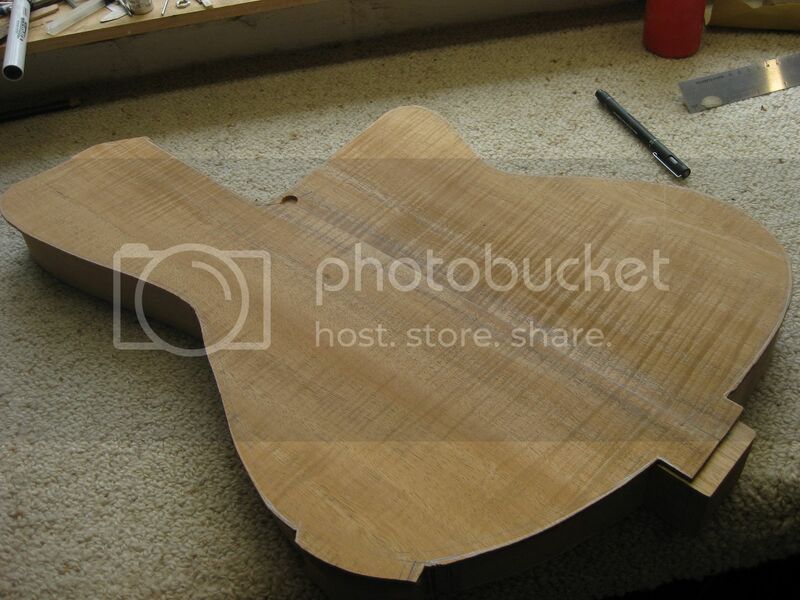 While the upper bout strut will remain, the supporting block in the pickup rout will be machined away when I rout out the top plate for the koa pickup cover. 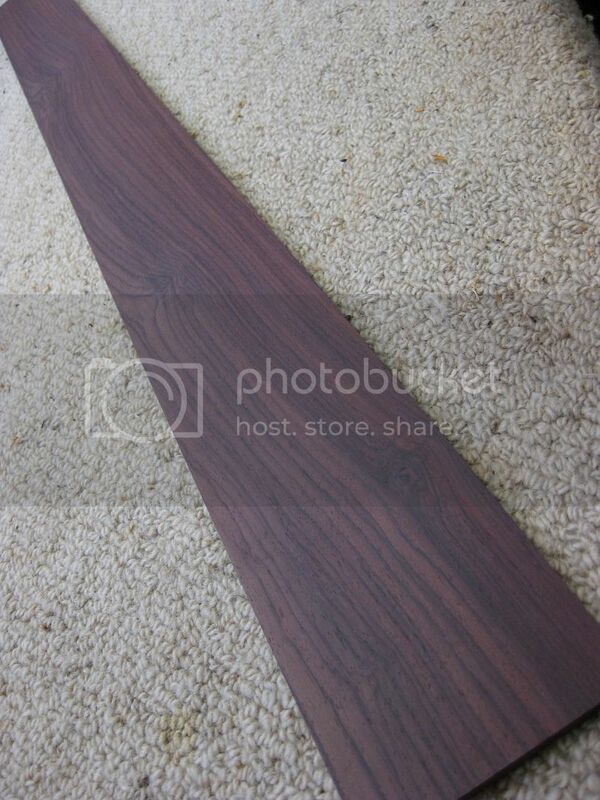 Next are some shots of the Koa top plate and the black veneer sheets. 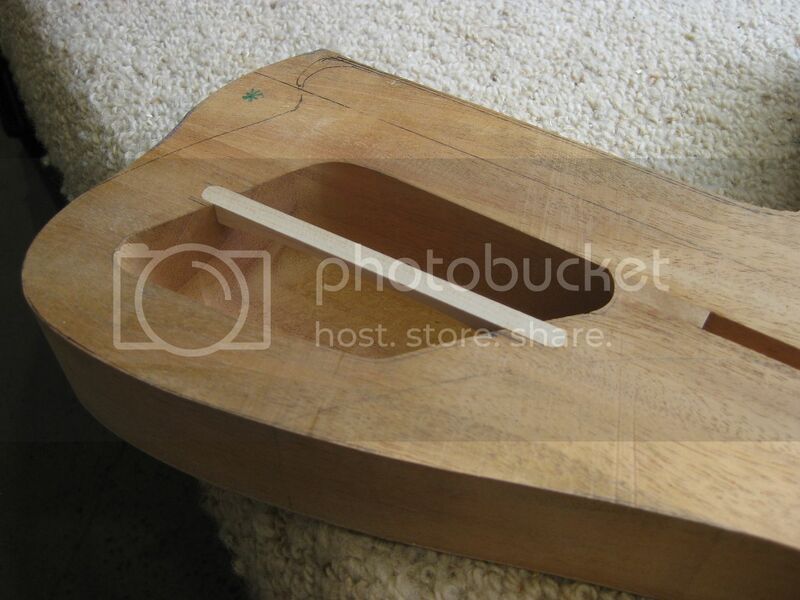 I align the sheets of material on the body working off a centre line and a small 'peep hole' drilled into the koa. This is all then screwed together with three locating fasteners to keep it all in its exact place for the vacuum bag gluing process. All that beautiful internal detail work is about to be hidden forever!!! And then into the vacuum bag! 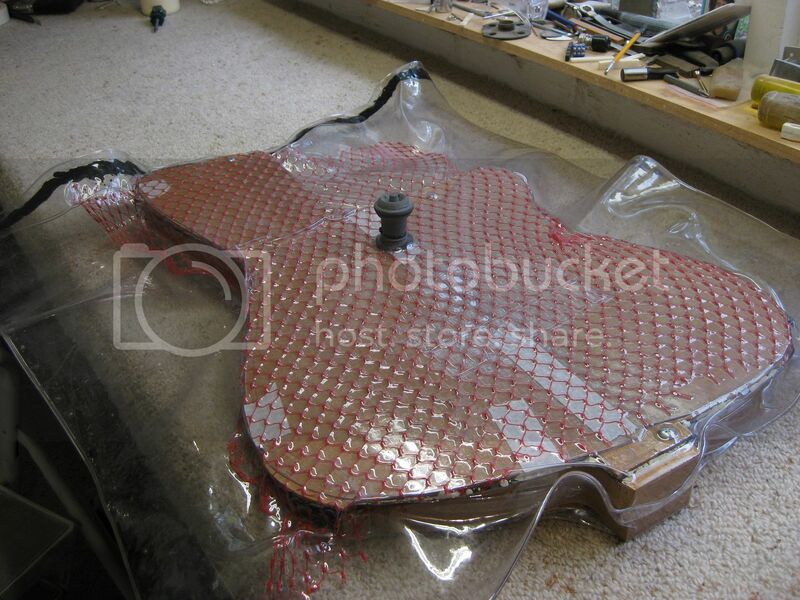 These shots show the laminates on the body in the vacuum bag, all glued up. They'll stay in the bag overnight until the glue has sufficiently dried. 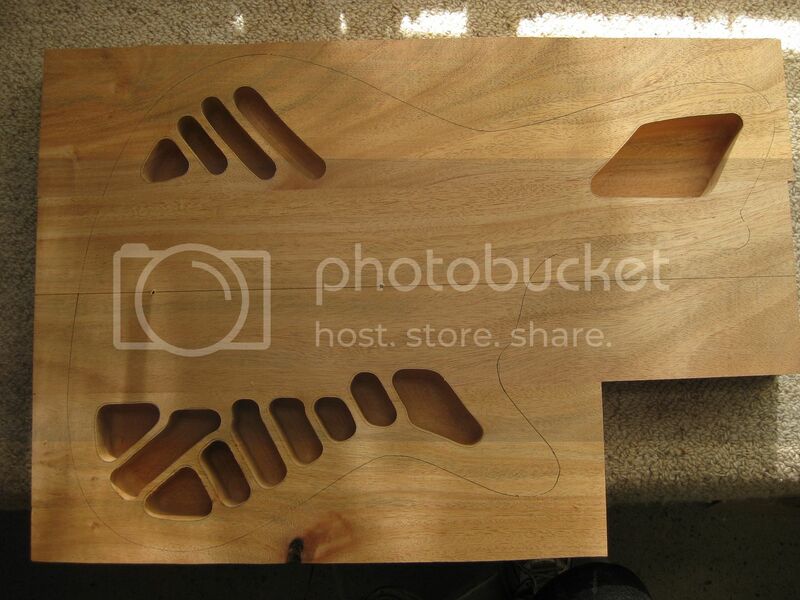 The veneer and koa top plate are screwed together with three locating fasteners to keep everything in its place during this process. 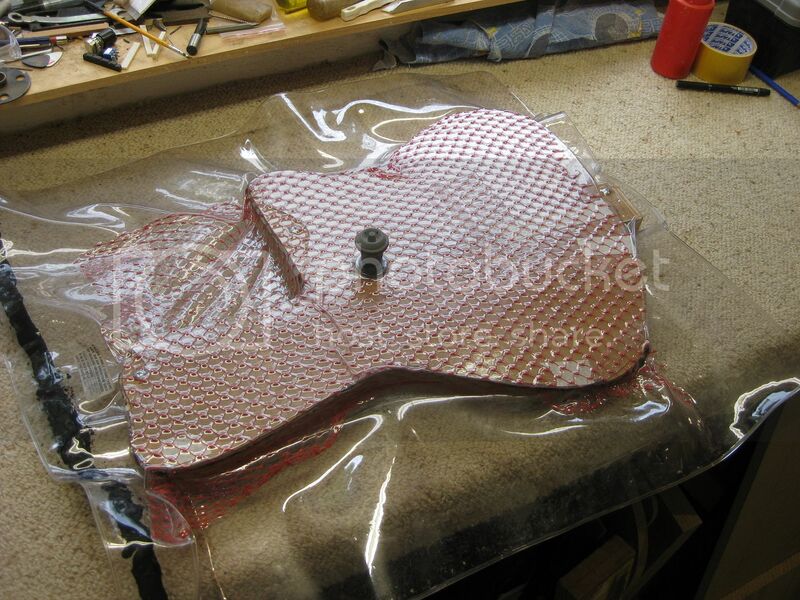 You can also see the plastic mesh that you wrap the timber in to help vacate the air evenly from around the body. In the morning I'll open the bag up, remove the screws and scrape off any unwanted glue from the top. 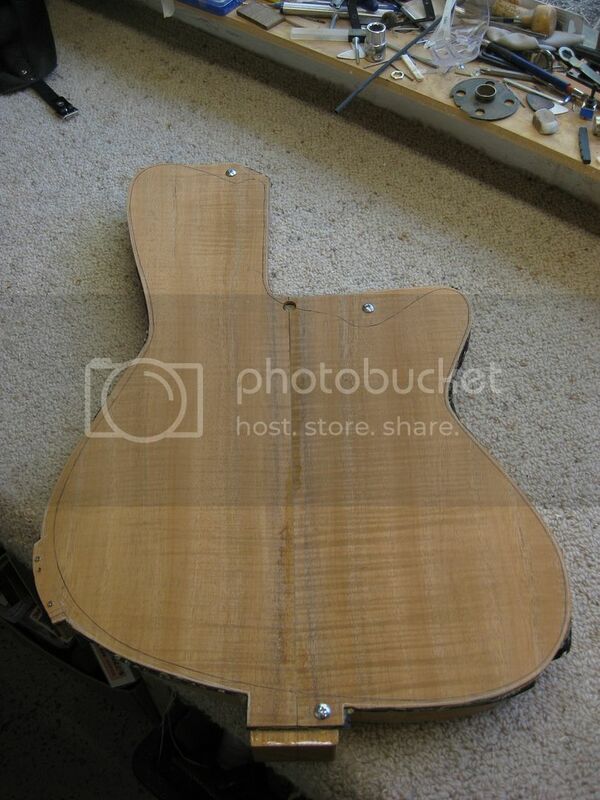 The body will be left for a few days for the glue to harden and then its back to the next shaping/routing processes. 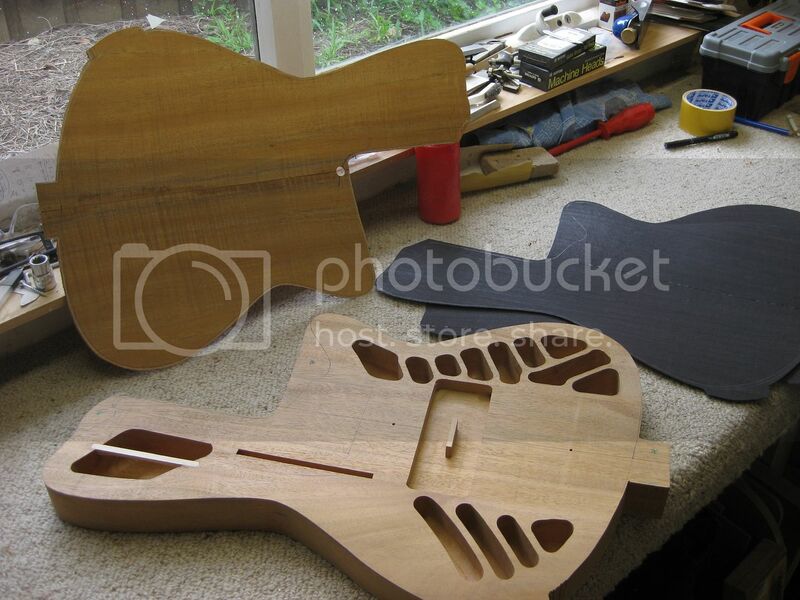 Some update shots of David Galea's bass build. 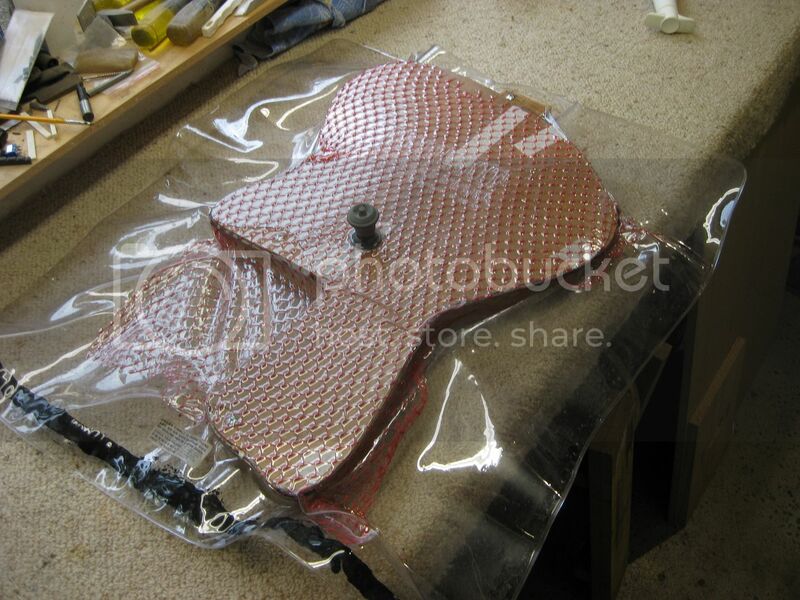 In these next few shots I show the body out of its vacuum bag (all rough around its edges). Then trimmed up to what will be its true dimensions. 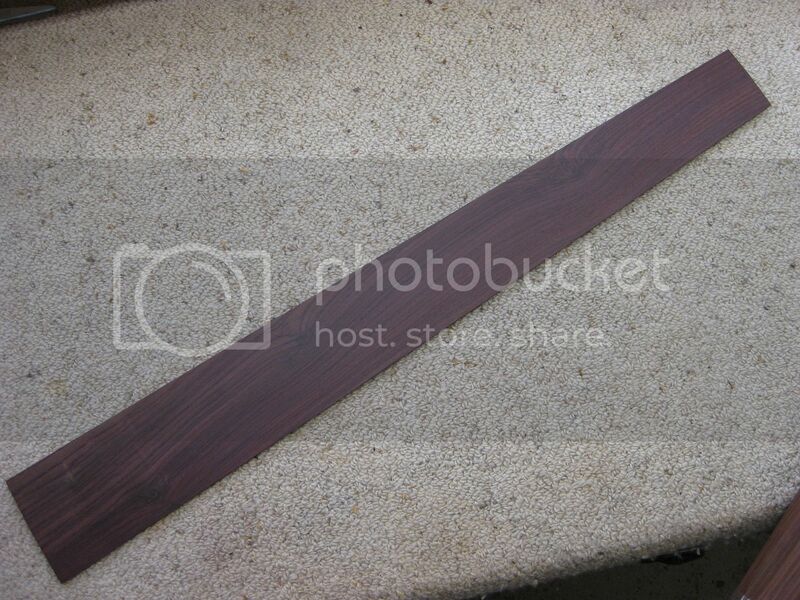 There's also a shot of a test piece of timber showing the veneer between the Koa top and the mahogany. 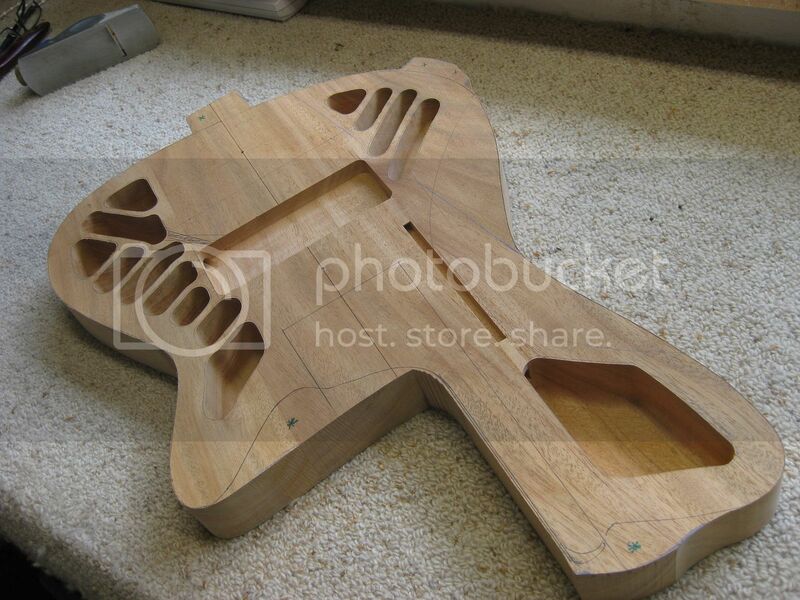 There's also a shot of the mighty Hipshot 'D' style two piece bridge assembly.